Only official sources for vehicle registration details, finance owing, stolen vehicle data & write-off history. Why Choose Quick PPSR Report? Carrying out your PPSR Reports with us is fast, simple, and affordable. At a small PPSR fee of $5.90, you can access the PPSR search report on any vehicle. This is the most affordable PPSR search fee in the market for provided features. We understand that a good car can sell out in no time. We don't want you to wait either. With Quick PPSR, you get your 100% accurate PPSR report to you in seconds. Our reports are not only quickly generated, they are easy to understand too. Only relevant information is put across in a presentable format for your convenience. Thousands of PPSR checks have been conducted on the QuickPPSR platform to date. Our reports have been reviewed by real customers which shows our trust and popularity. What does the Quick PPSR Report Offer? The PPSR check is going to be the best investment you ever made. You are going to get really high returns on this small amount of money - a great second-hand car and not a lemon. Here is what you can expect from a PPSR Report generated by Quick PPSR. Discover any outstanding loans - personal or vehicle loans - associated with the vehicle you are purchasing with the PPSR search. This section will detail the registration number as well as the start and end dates of the registration. Our PPSR Check will flag a stolen vehicle. If you do come across such a vehicle, you can report it to the authorities and shield yourself from any potential legal complications. The report offers the description of the car, registration plate number, VIN, and the Chassis number for cross-checking with the other vehicle documents. Since we are working through the PPSR and the NEVDIS, we have legal and direct access to all the components of a PPSR report. With our report, you will also get an official PPSR certificate. A PPSR vehicle check can tell you exactly what kind of a commitment you are really getting into with the purchase. If it has been written-off, then the car has suffered an overwhelming amount of damage due to water, fire, or other factors. We make getting your report fast and easy to do. No lengthy process, no need for your personal details. It can all be done with a quick and simple 3-step process. Get your PPSR Report in 3 simple steps. Enter the vehicle rego number or VIN. If you're using the rego number to search, you will need to select the state in which the car is registered. Click Get Report, input your preferred email address where you want to receive the report, pay, and submit your request. The process is that simple. You will get an SMS notification as well as an emailed version of the report. You can then download to save and access it at anytime, anywhere. A car history report should not be expensive. It's after all a necessary report to protect your investment. So, pay less while you work with one of the best. No need to wait hours or days to get a vehicle report. Get your PPSR report delivered in seconds once you complete the process online on our secure platform. No need to wonder what you're looking at. Just scan through easily and quickly so you can decide whether it's a deal worth pursuing, or you dodged a bad one. The Personal Property Securities Register (PPSR) is a comprehensive database managed by the Government of Australia that lists personal properties ? such as vehicles ? that people have a security interest in (aka owe money on/for). The PPSR is therefore a collection of properties that are personally owned and have been used by owners as security to obtain loans. Only properties that have been listed under the PPSR can be found with a PPSR check. These properties do not extend to land used as security. The most common properties listed under the PPS Register are cars, boats, trucks, artwork, and machinery. Buyers who are interested in these properties can trace the financial history/encumbrance owing on them and use the results to make decisions with regard to purchasing that property. REVS stands for the Register of Encumbered Vehicles. This was the Australian government registry that came before the PPSR. Unlike the PPSR which is a database that contains the financial records of all personal properties registered with the PPSR, the REVS had detailed the security interest status of only cars and other vehicles. It did not extend to boats and machines. Until the formation of the PPSR in 2012, the REVS was the only registry to deal with finance owing on cars. A Vehicle Identification Number or VIN is a unique 17-digit code that identifies a vehicle. The VIN is the identification number used to pick out cars for administrative purposes. Unlike the registration number (number plate), the VIN of a vehicle does not change. The VIN is unique to a specific car and is located in different areas depending on the make and model of the car. Car owner manuals will tell/show owners where to look to find the VIN like the dashboard, door, etc. The VIN is also one of the main methods of running a car history check. Do I need PPSR Check before buying a car? If you are buying a used car, then yes, you most definitely need to get this check done. A PPSR check will let you know if there is money owing against the vehicle. The same goes if you want to buy other personal property such as intellectual rights, boats, artwork, stocks, machines, and even livestock. Knowing the encumbrance on a property will help you make the decision on whether you are going to buy it or not. Personal property with finance owing comes with a higher risk compared to properties that do not have any encumbrance and therefore no risk of repossession by a lender. Coupled with the information from NEVDIS, your car history report with PPSR certificate is the one stop document that helps you make informed decisions. Is the PPSR Right For You? Who is the PPSR for? The PPSR is used by both lenders and buyers to check the financial encumbrance history of personal property like that second-hand car you want to buy. So, how do you know if it is right for you and who it is for? As a private buyer, you may be apprehensive about buying a used car and not knowing its full history. So, run a check while you're discussing the details with the seller then and there. Within seconds, both of you can be negotiating based on the actual facts as recorded by the government. As a used car dealer, you are more than likely used to doing trade-ins when a buyer wants to upgrade or downgrade their vehicles. But, you have to protect yourself so that you aren't duped. That's where the results from this online search become essential. Even though it's a trade in, you need to be able to verify the vehicle details so that an eventual buyer doesn't end up thinking you're the one trying to dupe them and ruin your reputation. On the other hand, offering reports to used car buyers can help you close the sale. Simply run a check while they wait and hand them the results in seconds to show you are serious about providing them with accurate information. Has someone pledged to use their vehicle as security for a loan? But what happens if they default and someone claims prior access to the car for recovery of debts? Issues like this can be easily avoided with just by running a check. Before you lend, you can determine if the vehicle is already encumbered and for how much. Then, if you're willing to still lend based on how much ? if any ? registered on the car, you can then register your secured interest on that vehicle in the government database. Every car history check done with QuickPPSR comes with an official PPSR certificate from the AFSA and an easy-to-read report. There are several sections in your report, and each offers a different set of information on the vehicle you want to buy. Here are the sections that you can expect to see in your report. Now this section is important for two main reasons. Firstly, you want to make sure that you are assessing the same car that the seller is trying to offload. If the registration and vehicle details don't match with what the seller has given or shown to you, then something is wrong. The second reason why this section is important is the necessary rego details. Driving an unregistered car on Australian roads is illegal. If you will need to pick up the vehicle when buying make sure you won't get in trouble as you head back home. Australia on a whole has a high rate of vehicle theft. Plus, because you can sell vehicles across states, there's nothing stopping someone from stealing a car in WA and selling it in Queensland. So that you aren't the unlucky few, a check online of the databases will let you know if the car was reported stolen. Sometimes a vehicle can be written off but fixed to look like new and re-registered for road use. But, suppose you don't want a car that has been fixed for severe damage like collision and fire? What do you do if you've already spent your money? Well, we don't have any options after you've spent. But, if you haven't bought the second-hand car yet, then this is the time to know about the accident history of the vehicle. This is by far one of the main reasons people love the PPSR. When you can at the click of a button know within seconds if a seller still has money owing on the vehicle, you now know how to handle the transaction. You can choose to go ahead after discussing payment terms with the seller. Or, you can choose to forgo the whole thing, especially if it seemed as if the seller was trying to hide this fact. Depending on what that information is in the report, you can decide whether buying is worth it or not. While we most tend to focus on what is present in our vehicle history reports, we often overlook the very tangible reasons why this report is critical in the buying process. Here are 3 reasons why we've found the PPSR to be so very useful, and why you will too. Is it the legally registered owner selling you a vehicle? How can you tell? The Report provides both stolen status checks and registration details. The registration info will have who currently is the registered owner (including if the bank still owns it because of debt by the seller). Plus, the stolen status check will highlight if the vehicle was stolen and not recovered. It's protection from repossession, protection from receiving stolen goods, from bad debts, bad deals, and so much more. With data compiled from official government records, you are assured of details as accurate as the government can make them. Plus, the official certificate that is provided with a report is your assurance for any problems that may crop up down the road. A creditor didn't register their interest in the used car you bought? You can defend yourself with official proof of your search before you bought. Nothing can be more comforting than knowing that you spent your money wisely. A car - even a second-hand one - isn't cheap. That's why it's so important that you have all the facts so you can make an informed and critical decision. That's what these reports offered by QuickPPSR does - eliminate the guesswork and put you on firm footing to assess a deal quickly. So, before you complete a car purchase ask - did I do a PPSR check first to protect myself? Or, if you see a friend or a family member about to buy a used car with no official background detail, explain why they need this report and how easy it is to get it done at QuickPPSR. What Happened to REVS Checks? 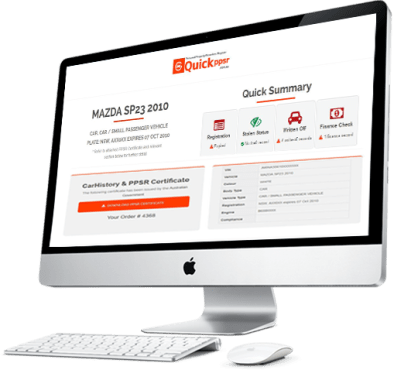 Quick PPSR is an online service that allows users to conduct PPSR checks on used vehicles. Each PPSR Check comes with a PPSR Search Report. We also avail government-generated PPSR Certificates to potential car owners at Quick PPSR. Our services cover cars and other motor vehicles. Why Should You Do A PPSR Check? What is PPSR Certificate and How to Read it?